I was fortunate to be invited to the National Association of Latino Independent Producers (NALIP) 2013 Conference, which took place in Los Angeles this past June 7-9. The Conference was entitled “Spotlight on the Trillion $ Latino Market” and yes, U.S. Latinos represent over $1 trillion in spending power and counting as well as the lion’s share growth within the 18-49 consumer demographic. A no-brainer if you’re interested in the success of your business, but, more importantly, the conference was well run and organized, definitely a sign that the Latino market has come of age. Gone are the days when Latino events were thrown together and you got the sense that they were flying by the seat of their pants. Not this time. I arrived to register on Friday, June 8 at the Sheraton Universal Hotel at Universal City, where the conference took place. As a Speaker, I had no problem registering and obtaining my Speaker Packet, which contained a nice conference schedule and other helpful materials to guide you through the Conference. The Conference office was well organized with signs pointing you in the right direction and courteous staff answering your questions and helping you along. The list of speakers and variety of panels covered a wide range, the Keynote Speakers were interesting and engaging and the range of filmmaker talent was very impressive. Demographics and technology have changed America. The Latino market has gone mainstream and the new 18-49 American consumer is increasingly a Latino using a mobile device. The 50+ and boomer generation are generally older, white Americans who are active, wired and a viable consumer market. Reyes Entertainment has been at the forefront of changes in the Hispanic market and we are adapting by engaging consumers via culture and technology vs. ethnicity or language. 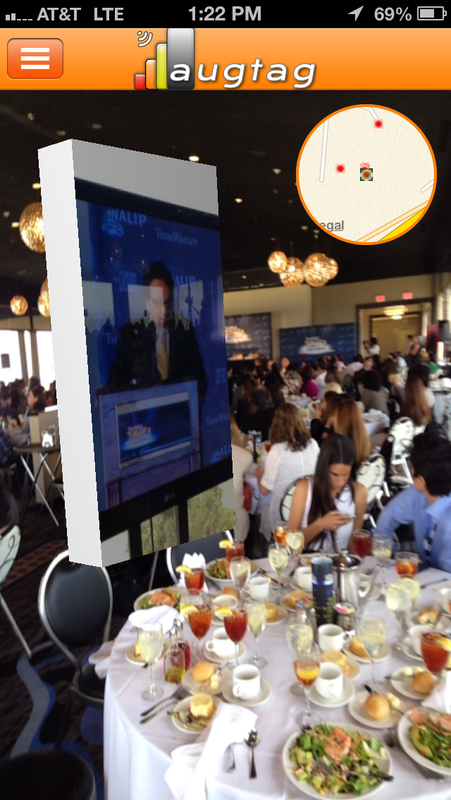 Reyes Entertainment is associated with GAMAGI, an Austin-based startup that has created AugTag™ is a new augmented reality (AR) mobile app, which allows you to tie your memories to a place by “tagging” important places with your photos, videos or other 3D images. Augmented Reality represents the future of media sharing and a huge leap forward in new consumer technologies with multiple applications. Each project is its own marketing ecosystem presenting PR and promotion opportunities in different areas of the film. Multicultural Millennials are the new movie audiences. According to U.S. Census, “minority” kids will comprise over 50% of the under-18 population by 2018. Elements of film marketing and publicity. I, then, opened the discussion and asked those present about their personal projects and what advice they might need to move forward. The time went by so fast as I and those present engaged in such a lively and wonderful conversation about finding creative ways to promote your film not just to Latinos but to all audiences. I found my audience was engaged and helpful and full of passion. They all believed in their projects and you could feel the camaraderie and support as they were palpable in the room. I came away truly inspired and energized and want to thank those who attended the workshop. Creating Movements for Social Justice Through Media. This panel was about harnessing the power of the media to create a national conversation to bring about change. Awesome panelists like Axel Caballero, founder of Cuéntame; Ana Roca Castro, founder of LATISM and filmmaker Alex Rivera, moderated by Rosa Alonso, founder of Mi Vida Tec – With Rosa Alonso. I found the panelists fascinating and was awed and impressed by how they are using social media and the power of their digital voice to help people in need and bring about sustainable prosperity. The New Generation Latino Actors: Trailblazers who are making it work in today’s industry. I was thrilled to meet up with young Latino Hollywood up-and-comers like Gina Rodriguez, Nicholas Gonzalez, Jeremy Ray Valdez and Jesse Garcia as well as the lovely and talented Justina Machado. Moderated by “Primer Impacto” Entertainment Correspondent Daniela Ganoza, the panel featured a fascinating discussion about what Latinos encounter in the entertainment industry and how they are overcoming barriers by creating and distributing their own projects. I came away impressed and inspired by their talent and their wisdom at such a young age. The highlight was the NALIP 2013 Gala Awards Dinner, which was star-studded and proved to be a truly high-caliber evening all around. 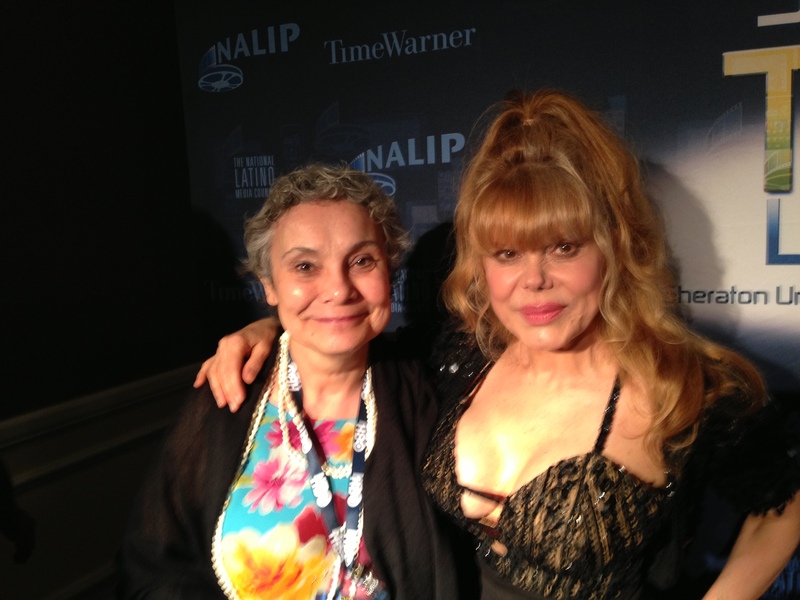 I showed up around 7 PM with my good friend and client Charo, who is an iconic legend in entertainment. She was accompanied by her husband and her son Shel Rasten, who is also an actor, musician, and film producer. Shel has a short film entitled “The Boulevard,” which will premiere at The Palm Springs Film Festival and move on to Las Vegas Film Festival in July. Above are Shel and Charo with Hollywood star Ray Liotta. I was thrilled to see and catch up with so many good friends. Ben DeJesús. NALIP Estela Documentary Award: Tales From A Ghetto Klown. Ben was so funny and gracious accepting the award from Natalia Almada and Max Gallegos of McDonald’s. He promised that some of the cash awards would be “spent on happy meals and quarter pounders.” Above, Ben with Charo. Aurora Guerrero. 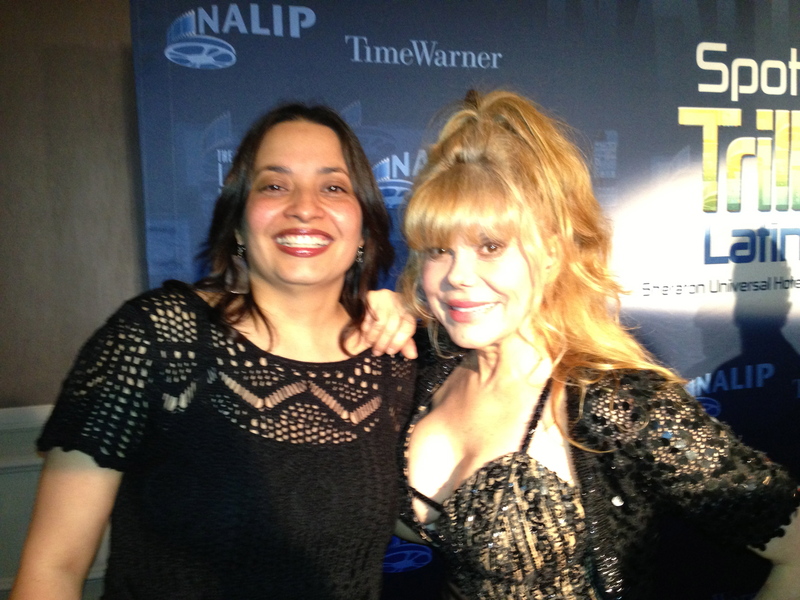 NALIP Estela Narrative Award: Mosquita y Mari. Aurora is a chingona lesbian Chicana from the bay area who created a beautiful and moving picture of two young L.A. Chicanas in love. Her speech was heartfelt and moving and made me proud to be gay. Esai Morales, Felix Sanchez, and Merel Julia accepted the NALIP Media Advocacy Award on behalf of the National Hispanic Foundation for the Arts. Above, Aurora with Charo. Gina Rodriguez. NALIP’s The Lupe Award, named for the indomitable Lupe Ontiveros. This was the most moving and wonderful moment of the evening. The award was presented by Lupe’s sons and her granddaughters, along with the fabulous playwright Josefina Lopez. But when Gina Rodriguez took the stage and delivered a tearful but electric acceptance speech, the room was literally aglow with her superstar energy. 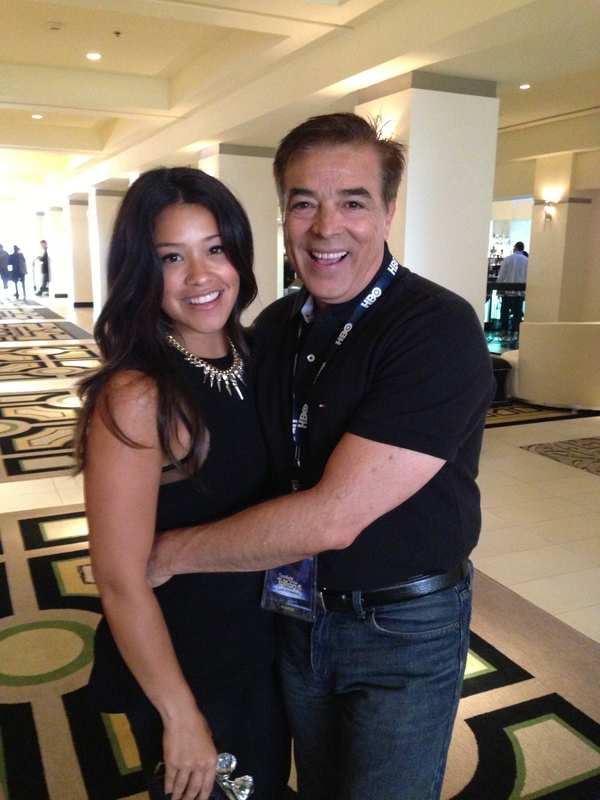 I’m saying it now, watch out JLo, here come Gina Rodriguez. This girl is headed for global superstardom. Above, is yours truly with Gina. Danny Trejo. NALIP Lifetime Achievement Award. Danny is a real gentleman and a funny, funny man. He came across and very real and genuine and shared personal stories of struggle with humor and dignity. 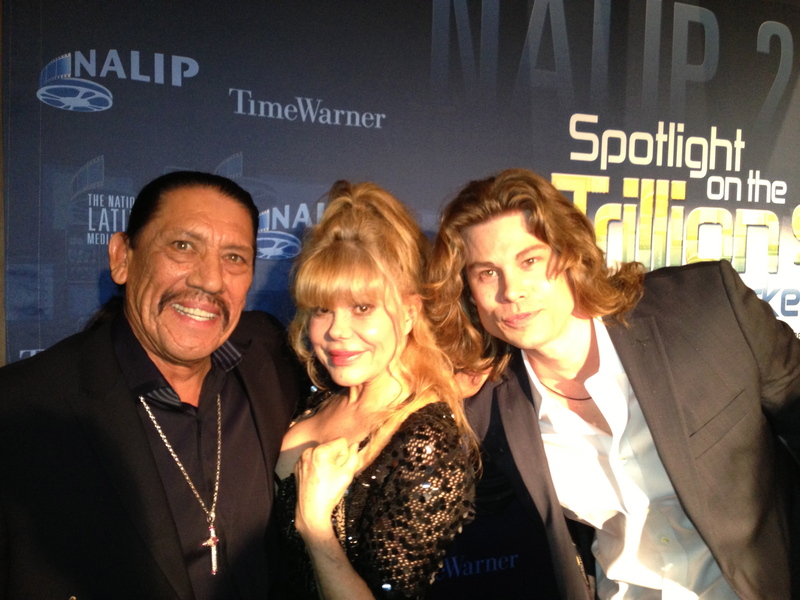 Above is Danny with Charo and her son Shel Rasten. Charo and her family had a wonderful time and she’s since commented to me how the event was so much better than other “boring” award shows. 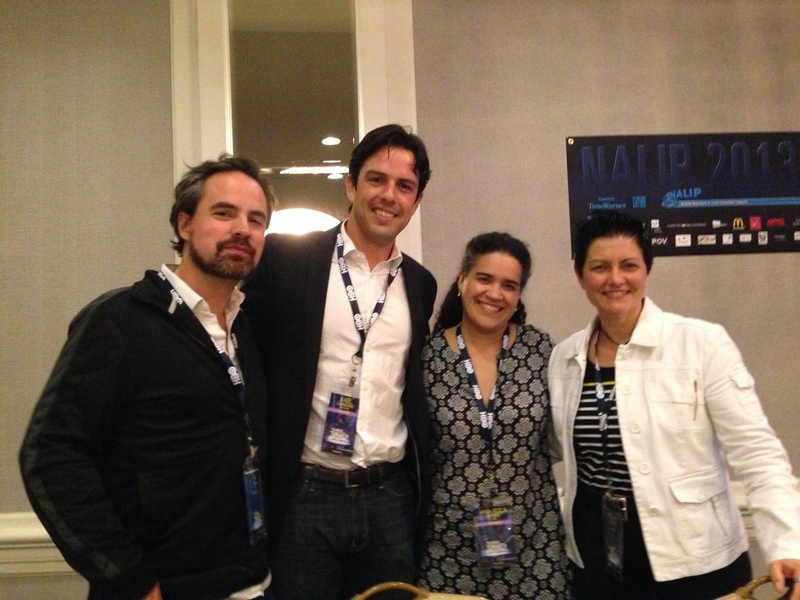 I’m delighted to have been a part of NALIP 2013 and want to thank Beni Matias, Maria Agui Carter, Octavio Marin, the entire staff and Board of Directors of NALIP for delivering such an impressive and well-oiled conference. I am already looking forward to 2014! Above is Charo with Beni!